Schwab consistently ranks as one of the best online brokers for stock trading. Low commissions, a vast array of securities available to trade, managed services via Intelligent Portfolios, and a broad selection of account types all add to its reputation. Fidelity is best known for its no-transaction-fee mutual funds but its brokerage firm stands toe to toe with top brokers, including Schwab. 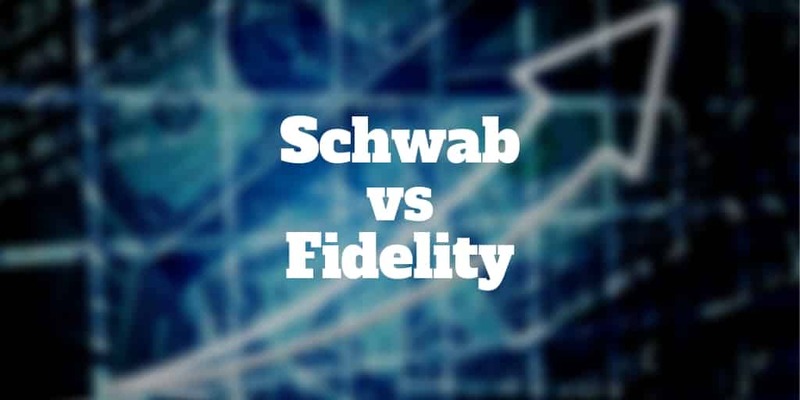 Comparing Schwab vs Fidelity, the question is who comes out on top? On equity commissions rates, Schwab and Fidelity cannot be separated. Both charge flat fees of $4.95. As you would expect of two top stock brokers, they each provide a full range of services, including the ability to buy and sell options and futures contracts. For customers with higher account balances, both firms offer personalized customer service and investment advice. However, they each stand out in different ways so let’s see how they compare on key factors. Fidelity and Schwab have similar fee structures for their discount brokerage arms. Each permits unlimited equity trades for $4.95 per trade. The base option rates at each broker is $4.95 as well as a per options contract commissions cost of $0.65. Schwab currently charges a $76 flat fee to buy mutual funds. However, it also offers free trades in both Schwab OneSource Funds as well as U.S. Treasury Securities. Fidelity’s fees for mutual fund products range from zero dollars for no-transaction-fee mutual funds to $49.95. Neither broker charges annual fees on IRA accounts. Schwab offers two trading platforms, neither of which has fee or trade minimums. Fidelity offers Active Trader Pro, which is downloadable to desktop or can be used via web interface. Where Schwab shines brightest is it has a service to match the needs of any investor. Looking for commission-free ETFs or extensive research? Learning to trade for the first time or an old pro? Schwab’s got it all. StreetSmart (formerly OptionsXpress) and Trade Source are its two trading platforms. StreetSmart is available via web-based interface or downloadable desktop. For traders on-the-go, a mobile version is available too. Trade Source is a 100% online platform that features research, technical charts and studies, and real-time pricing. If you are just getting started as a beginner stock trader, StreetSmart will suffice. For options traders, Street Smart Central has more bells and whistles. Clients who need a quick and easy trading experience should look to StreetSmart Edge. Selecting symbols, placing trades, viewing balances, and trading history is all a cinch. You will be spoiled for choice at Fidelity too because downloadable desktop, web-based, and mobile trading platforms are all available. Active Trader Pro can be accessed online or downloaded. It’s customizable, so if you use similar options strategies again and again or prefer certain technical chart studies you can store them easily for repeat use. Experienced investors should check out Wealth-Lab Pro, which features decades worth of data that can be filtered to build custom trading strategies. Fidelity earns high marks for its highly impressive options trading experience via mobile, a feat few brokers emulate. Both Schwab and Fidelity offer a vast selection of securities in which their clients can easily, cheaply, and instantly invest. There are some subtle differences in the firms’ offerings, however. Schwab and Fidelity offer the full range of exchange-traded equities. Both companies also have the same flat $4.95 fee for equity trades. Fidelity and Schwab allow clients to buy any exchange-traded options. The flat fee for options is currently $4.95 plus $0.65 for each contract at both Schwab and Fidelity. Mutual funds are one area where Fidelity and Schwab substantially differ. Fidelity currently offers more than 12,500+ mutual funds, which compares favorably to the 5,500+ currently available at Schwab. Fidelity also offers a number of its own mutual funds to clients, and some of these come with no associated fee, whereas all mutual funds bought through Schwab carry the same $76 fee. Mutual funds bought via Fidelity incur a maximum fee of $49.95. Both offer around 250 (give or take) commission-free exchange-traded funds. Both Schwab and Fidelity enable clients to buy most ETFs. Schwab offers free purchases of U.S. Treasury securities while only Fidelity offers free trades on new-issue bonds. Neither Fidelity nor Schwab offers forex trading capabilities to their clients. Fidelity has no minimum deposit amount for its discount brokerage accounts while Schwab imposes a relatively low minimum of $1,000 for its standard accounts. The Schwab investment minimum can be waived with regular monthly deposits of $100. Compared to TD Ameritrade, Schwab falls short in this area. Long-term investors will be delighted to know that even Fidelity funds and index funds have no investment minimums anymore. Better still, the Fidelity ZERO International Index Funds and Fidelity ZERO Total Market Index Fund have no expense ratios, a rarity among mutual funds. But to access Fidelity promotions, you’ll need to commit a minimum of $50,000 – a tall order for most retail investors. Even though both Schwab and Fidelity are first and foremost brokerage services, clients who are looking to plan for retirement, save for college, or even form trusts will also find products to suit their needs. These options make Schwab a superior choice for those who are looking for seamless integration with its daily banking in a brokerage or other financial account. Fidelity offers almost all of the same accounts as Schwab does, except it does not have FDIC-insured checking and currently is not offering high-yield savings. However, Fidelity does offer certificates of deposit of varying term lengths. In some circumstances, these options may be even more attractive than a savings account. Both Schwab and Fidelity feature services to lower the tax impact of clients across account types. Both also offer government-approved retirement accounts that come with certain tax deferments. A large part of Fidelity’s overall business involves the servicing of various defined-contribution retirement accounts. These accounts generally have very low fees when compared to other traditional retirement planning services. When it comes to customer support, both Fidelity and Charles Schwab rank highly among low-cost brokerage services. Schwab offers more personalized customer service options as client balances grow and has a large number of personal financial planning services. These include its Personal Portfolio Review and its portfolio management services, which feature Diversified Management Accounts and Schwab Managed Portfolios. Customer support is available around the clock by phone and at over 300 brick-and-mortar branches nationwide. Fidelity tends to be more focused on keeping prices low for individual traders. As a result, the company offers fewer personalized account management services, but this does not mean that Fidelity does not offer top-flight customer service. On the contrary, Fidelity also provides 24/7 phone support, as well as live chat and broker-assisted trades. Fidelity consistently ranks in the top spots for customer service in brokerage industry comparisons. For value-oriented investors and those who may want additional help in managing their portfolios, Schwab is going to be the slightly better choice with its automated investment management service, Essential Portfolios. Schwab and Fidelity both feature mobile apps that can keep clients connected to their investments on-the-go. iPhone, iPad, and Android devices are all supported, as well as the Apple Watch. However, Schwab currently does not offer tablet apps for Android. >> What Is The Best Way To Invest $10,000? Due to its slightly better overall pricing structure and its more robust day-trading platform, Fidelity just about wins the price battle – certainly when it comes to broker-assisted trades and mutual funds. Buy-and-hold mutual fund investors will fare best at Fidelity, which has a broader selection of funds and is renowned in the industry for its diverse selection. If you are a stock or options trader you won’t experience much difference, though we give the edge to Schwab following its acquisition of OptionsXpress and integration of its platform into its suite of offerings. Clients seeking managed services will also fare better at Schwab thanks to its robo-advisor solution, Schwab Intelligent Portfolios. For those with more complex financial situations, Schwab also has the edge with a broader selection of account types. Founded in 1971, Charles Schwab was the first discount brokerage firm. And all these years later it remains one of largest brokerage firms in the United States while still honoring its founding principles to provide low commissions trading services. Charles Schwab also provides a large number of other financial services, including banking, retirement planning, full-service wealth management, as well as automated investment management. Fidelity Investments is far older than Schwab and is one of the largest financial services companies in America. The company was founded in 1946 and is renowned as a mutual fund specialist. Some of the largest mutual funds in the world originate from Fidelity, which manages a large number of its own funds. ‹ What Are The Best Real Estate Investing Websites?